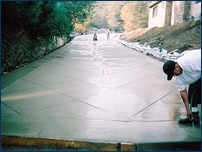 Whether its parking lot slabs, curbs, sidewalks, driveways or wheelchair access ramps, Ikon Concrete Design delivers quality, precision and efficiency with any type of finish to meet our customers’ goals. From residential to commercial, we handle each job with an eye for detail and a focus on keeping job sites clean and safe. Preparation is the key to each job; preparation defines your concrete. Whatever the blueprints call for, sand base, rebar or fiber reinforcement, Ikon prides itself on being able to carry out plans to exact specifications. With everything from grading and drainage, to form work and compaction, clean and precise work is necessary to deliver a final product that is worthy of the Ikon name. With multiple crews, specifically assigned to take advantage of various skill sets, we utilize experience, knowledge and cutting-edge technologies to deliver top-notch projects. The final touch of every job is the finish used to bring life to the project. With literally thousands of finishing products on the market, we maintain an active and vigilant pulse on continuously emerging concrete technologies to ensure that we can deliver any finish a customer can imagine. 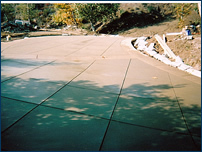 Additionally, the final active step in the finishing process involves protecting your concrete. 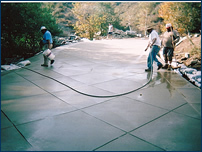 Combining the numerous options mentioned above with dozens of available curing compounds and sealers, our goal is to provide every option available, with every tool available to create the best possible look for your concrete. With the latest cutting-edge technology in equipment, Ikon is able to utilize all the available options in the most efficient and effective manner on each project. Add to that the ability to expand production to multiple pours, to meet deadlines, and you build a recipe for success that Ikon strives for with respect to every customer. Ikon believes that a clean work environment is one of the first steps necessary in providing a safe work site. Our employees have the experience and knowledge necessary to create and maintain a high level of safety. Further, the safety of our customers is paramount and to that end, we are committed to providing the expertise necessary to ensure the safety of everyone on our work sites.